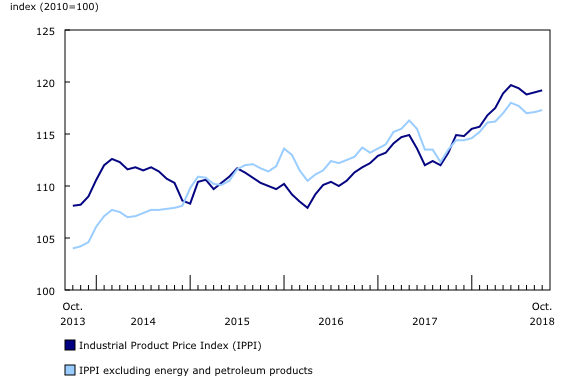 Prices for products sold by Canadian manufacturers, as measured by the Industrial Product Price Index (IPPI), rose 0.2% in October, mostly driven by higher prices for meat, fish, and dairy products. 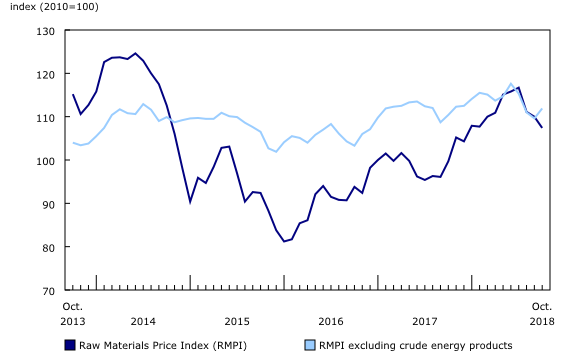 Prices for raw materials purchased by Canadian manufacturers, as measured by the Raw Materials Price Index (RMPI), fell 2.4%, mainly as a result of lower prices for crude energy products. The IPPI rose 0.2% in October, following an identical increase in September. Of the 21 major commodity groups, 10 were up, 6 were down and 5 were unchanged. The IPPI excluding energy and petroleum products also rose 0.2%. Higher prices for meat, fish, and dairy products (+0.9%) were largely responsible for the increase in the IPPI in October. The increase in this commodity group was mostly due to higher prices for fresh and frozen pork (+3.6%) and processed meat products, other meats and animal by-products (+2.3%). Prices for cheese and cheese products (+1.5%) and fluid milk and processed milk products (+0.6%) also contributed to the rise in this commodity group, but to a lesser extent. Prices for motorized and recreational vehicles (+0.3%) and energy and petroleum products (+0.2%) also rose in October. The growth in motorized and recreational vehicles resulted from a 1.3% increase in prices for light-duty trucks, vans and sport utility vehicles (SUVs). Prices for diesel fuel (+3.8%), light fuel oils (+2.9%) and lubricants and other petroleum refinery products (+5.5%) were mainly responsible for the growth in energy and petroleum products. However, lower prices for motor gasoline (-3.9%) partially offset this increase. Chemicals and chemical products were up 0.4% in October, following a 1.5% increase the previous month. This growth was mostly due to higher prices for ammonia and chemical fertilizers (+3.2%). Following a three-month decline, prices for primary non-ferrous metal products increased 0.3% in October. Unwrought precious metals and precious metal alloys (+1.5%) and unwrought copper and copper alloys (+3.1%) were responsible for this gain. However, prices for unwrought aluminum and aluminum alloys (-3.3%) continued their downward trend in October. The increase in the IPPI was primarily moderated by lumber and other wood products (-1.0%), mainly due to lower prices for softwood lumber (except tongue and groove and other edge worked lumber) (-10.5%) and veneer and plywood (-2.5%). Some IPPI prices are reported in US dollars and converted to Canadian dollars using the average monthly exchange rate. Consequently, any change in the value of the Canadian dollar relative to the US dollar will affect the level of the index. From September to October, the Canadian dollar appreciated 0.2% relative to the US dollar. If the exchange rate had remained constant, the growth of the IPPI would be the same due to the minimal appreciation of the Canadian dollar. Year over year, the IPPI rose 5.3% in October, following a 6.3% increase in September. Of the 21 major commodity groups, only primary non-ferrous metal products were down compared with October 2017. Prices for energy and petroleum products (+18.0%), particularly motor gasoline (+13.9%), light fuel oils (+23.2%) and diesel fuel (+24.9%), led the year-over-year increase in the IPPI in October. The IPPI excluding energy and petroleum products rose 3.3%. Pulp and paper products (+14.9%) also contributed to the growth of the IPPI, but to a lesser extent. This increase was mainly due to higher prices for wood pulp (+22.4%) and newsprint (+26.9%). Motorized and recreational vehicles (+2.5%) and chemicals and chemical products (+5.3%) were among the other commodity groups that rose compared with October 2017. The year-over-year increase in the IPPI was slightly moderated by lower prices for primary non-ferrous metal products (-5.0%). Lower prices for unwrought precious metals and precious metal alloys (-5.6%), other unwrought non-ferrous metals and non-ferrous metal alloys (-12.6%) and unwrought aluminum and aluminum alloys (-11.3%) were mostly behind the decline. The RMPI (-2.4%) was down for a third consecutive month in October, after falling 1.0% in September. Of the six major commodity groups, three were down and three were up. The decrease in the RMPI in October was mostly due to lower prices for crude energy products (-7.0%), particularly conventional crude oil (-7.3%), which posted its largest decrease since June 2017 (-9.6%). The RMPI excluding crude energy products rose 2.1%. Following declines of 7.3% in August and 1.2% in September, animals and animal products rose 4.0% in October, mainly attributable to higher prices for hogs (+22.0%). Prices for cattle and calves (+0.9%) also increased in October. Prices for metal ores, concentrates and scrap (+1.5%) also rose in October, following a 1.8% decrease the previous month. This was the first gain in four months for this commodity group. Compared with the same month a year earlier, the RMPI rose 7.7% in October, following a 14.5% increase in September. The gain in the RMPI was widespread, with only metal ores, concentrates and scrap down compared with October 2017. The year-over-year growth in the RMPI in October was primarily due to higher prices for crude energy products (+16.3%). Conventional crude oil (+16.8%) was mostly responsible for the increase in this commodity group. The RMPI excluding crude energy products was up 1.4%. To a lesser extent, animals and animal products (+3.0%) also contributed to the year-over-year increase in the IPPI, mainly due to higher prices for hogs (+10.8%). The growth in the RMPI was slightly offset by prices for metal ores, concentrates and scrap (-1.6%), which saw their first year-over-year decline since June 2016. The Industrial Product Price Index (IPPI) and Raw Materials Price Index (RMPI) are available at the Canada level only. Selected commodity groups within the IPPI are also available by region. With each release, data for the previous six months may have been revised. The indexes are not seasonally adjusted. The Industrial Product Price Index reflects the prices that producers in Canada receive as the goods leave the plant gate. It does not reflect what the consumer pays. Unlike the Consumer Price Index, the IPPI excludes indirect taxes and all the costs that occur between the time a good leaves the plant and the time the final user takes possession of it, including transportation, wholesale and retail costs. Canadian producers export many goods. They often indicate their prices in foreign currencies, especially in US dollars, which are then converted into Canadian dollars. In particular, this is the case for motor vehicles, pulp, paper and wood products. Therefore, a rise or fall in the value of the Canadian dollar against its US counterpart affects the IPPI. However, the conversion into Canadian dollars only reflects how respondents provide their prices. This is not a measure that takes the full effect of exchange rates into account. The conversion of prices received in US dollars is based on the average monthly exchange rate established by the Bank of Canada and available in table 33-10-0163-01 (series v111666275). Monthly and annual variations in the exchange rate, as described in the release, are calculated according to the indirect quotation of the exchange rate (for example, CAN$1 = US$X). The Raw Materials Price Index reflects the prices paid by Canadian manufacturers for key raw materials. Many of those prices are set on the world market. However, as few prices are denominated in foreign currencies, their conversion into Canadian dollars has only a minor effect on the calculation of the RMPI. The publication "A Historical Timeline of Canadian Producer Price Statistics," which is part of the Prices Analytical Series (Catalogue number62F0014M), was created to showcase the key milestones in the history of Canadian producer price statistics. This historical timeline contains answers to questions such as: Who collected Canada's first statistics? What do Canadian producer price indexes measure? Real-time table 18-10-0248-01 will be updated on December 10. The industrial product and raw materials price indexes for November 2018 will be released on January 4, 2019.